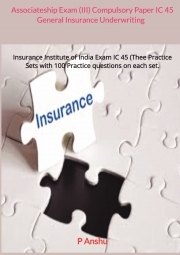 Description of "Associateship Exam (III) Compulsory Paper IC 45 General Insurance Underwriting"
Associateship exam conducted by Insurance Institute of India has some compulsory papers. This IC-45 General Insurance Underwriting is one of them. At this level, students may have option to choose subjects either Life or Non-Life or both combined. familiar with the practical aspects related to these subjects. Reviews of "Associateship Exam (III) Compulsory Paper IC 45 General Insurance Underwriting"